Saint Adalbert, Bishop and Martyr - My Catholic Life! Old, stodgy, traditional Catholic Europe in tension with new, liberal, flexible Europe is not a new dichotomy. A millennium ago the roles were reversed. It was old, stodgy, traditional pagan Europe in tension with new, groundbreaking, and progressive Catholic Europe. As the missionary monks, abbots, and bishops of Europe fanned out, ever northward and ever eastward, into upper Germany, Scandinavia, Poland, and the Baltics, they met the warrior tribes and painted chieftains of old Europe, men with skin like bark. These forest clans gathered in sacred groves to offer sacrifice to their pagan idols under the broad canopies of large oaks. In these open air temples they butchered prisoners of war and cattle in offerings to their dark powers, sprinkling the blood of the slain on their bodies. Yet from the eighth through the eleventh centuries, missionaries poured into these remote lands, shining the light of the Gospel into its darkest corners. Teutonic and Norse paganism, for all of its unwritten creeds of courage and manliness, was doomed. It was strong, but the Church was stronger. Paganism could not stop vital, solid, well-organized Catholicism with its coherent monotheism, sacred worship, Ten Commandments, self-sacrificing missionaries, and its Gospel of love and respect for all. The Catholic Church does not arrive to a mission territory, however, as a full-fledged institution. The Church arrives in a person who embodies all that the Church teaches and symbolizes. This person is the Church to those he encounters. Today’s saint was one of the first missionary bishops to penetrate into the lands of Prussia, in Northeastern Germany. And for daring to preach the Gospel to coarse men, he was murdered on the frigid coast of the Baltic Sea. The Prussians thought he was a Polish spy, and a pagan priest upset at the disruptions Adalbert was causing in Prussian society commanded his death. 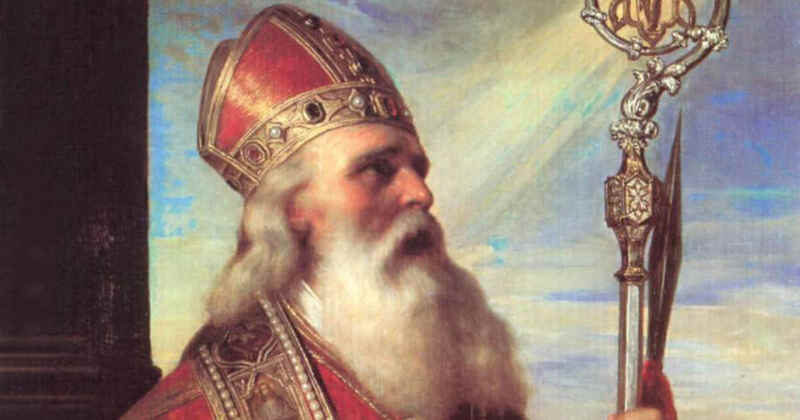 Saint Adalbert’s lifeless body was ransomed for its weight in gold by a Polish king and returned to Poland. 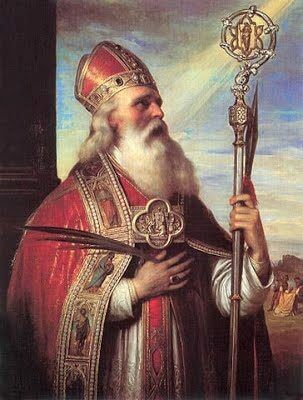 He was eventually canonized as Saint Adalbert of Prague, since he was born and raised in Bohemia. He remains a saint equally claimed by both the Polish and Czech people and a seminal figure in early medieval Europe. Courageous men like Saint Adalbert don’t just happen. They are forged over time in red hot fires. Adalbert had a long, difficult, and interesting ecclesiastical career before giving his life for the faith. He was baptized as Vojtěch. But he was so impressed with the saintly German Bishop named Adalbert who taught him, that he took his tutor’s name at Confirmation. Adalbert was then named Bishop of Prague at a young age, a consecration whose responsibilities turned him into a far more serious Christian. He quickly matured into his exalted vocation. Bishop Adalbert started aggressively challenging the people of his diocese to shed their pre-Christian customs and to learn what it meant to be true children of God. But Adalbert had a strong temperament and came from a noble family with serious enemies, all of which led him to abandon his diocese twice and flee to Rome. In the Eternal City, he came to know the Benedictines and lived as a monk for several months. Later he would establish Benedictine monasteries in the North in the hope of holding the Christian ground he gained. And to the North he always returned: to Bohemia, to Germany, to Hungary, and to Poland. He was a multilingual and multicultural Pan Slavic Bishop fully equipped to evangelize throughout Central and Eastern Europe. The rough Prussian people who murdered Adalbert were not fully conquered and converted until 1239, when the Teutonic Knights planted themselves in that land more than two hundred years after Saint Adalbert’s death. Yet somebody had to take the first step on the long journey of converting the Prussians. Someone first had to hear “No” a thousand times before someone unknown, much later, ever heard “Yes.” Adalbert heard “No” first and died for it. His body absorbed the blows so that other bodies could walk safely. His suffering and death proved that he, an educated man, was just as sturdy as the rugged men he sought to convert, and so was worthy of adding the title of martyr to that of bishop and monk. Saint Adalbert, we ask that you intercede before God to make all missionaries as courageous as you were, willing to place themselves in difficult situations for the good of the Church. By your example, may we be brave witnesses to the fact that death is sometimes preferable to life.